There is no significance in denying what is apparent, but a garage door opener is one of the primary aspects of the new home accessibility and convenience. Remarkably, we at Michiana Garage Door Service expedite a quality installation job for your unique needs. It is important to know that the typical garage door opener comprises of a reversible motor that operates a carriage along a rail structure above the garage door. The appliance attached to the carriage is a drawbar to move the garage door between the particular open and closed positions, with movement limiting devices to control doors movement accurately at the opening and closing positions. More so, most new garage door openers feature a radio receiver that allows users to open the garage door using a remote or electronic module in the car. Spread the garage door replacement parts on an open platform. Connect the coupler and the bumper to the power head. Insert the first rail section and then connect the remainder of the rail parts. Connect the rail clamps at the correct position on the rail side and the orient the slide carriage into the carriage slot at the end of the track. Next, connect the rail hooks to the end of the rail set-up. Once the rail section completes, we install the limit switch wires on the straps of the rail assembly and connect the two limit switches. The first switch is placed at about 7 inches from the end of the gray wire and the second is placed at a foot from the end of the rail section. Next, connect the safety release dial. Orient the header straps above the door and connect the set-up to the wall. Connect the power unit on the ceiling. Connect the straps to the door using appropriate screws. Position the door arm and hold in it place using a clevis device. Connect the other door arm to the rail section again using a clevis pin. Next, overlap both the door arms that run between the rail section and the garage door and secure both with using robust bolts. When installing the switch, ensure we usually ensure to locate the outlet wire where the sheath of white and red wire are also located. Connect the exposed pairs of wire to the switch and screw the switch to the wall. Finish by installing door sensor to either side of the garage door. 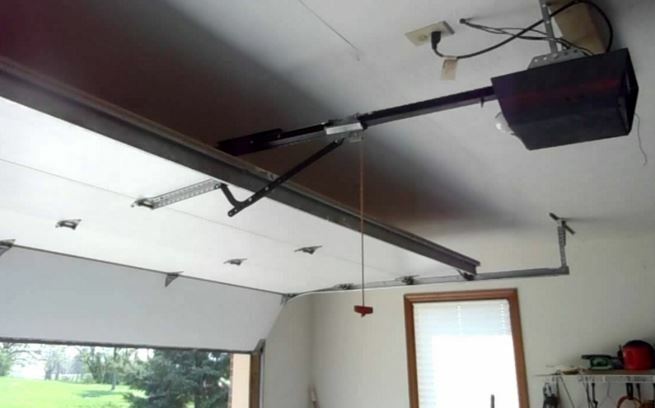 Before proceeding with any garage door repair process, it is inherent that you know that the garage door features counterbalance mechanisms under high forces that can snap at any moment leading to injury. Furthermore, before considering any repair process, we help all our clients in the estimation the garage door replacement cost to determine if buying additions for the door repair is feasible. More so, installing a new door opener might require the procurement of new garage replacement springs so that the entire system is compatible. We make installing garage doors nice and easy the way it should be. Experienced and fully-trained in most manufacturer models, we replace garage doors the right way the first time. Specializing in garage door repair and installation, our team of garage door technicians are licensed at hanging a garage door of all types. Whether it’s aluminum, steel or wood, Elkhart Garage Door Service will guarantee our work regardless of prototype. For those who want to do it yourself, consider that most garage doors are the biggest items at home. Garage doors are heavy and can be dangerous if the person doesn’t know how to adequately and safely install one. For a professional, it’s rather a quick and easy process because we have the right tools and experience with knowledge in how to install a garage door. First, we’ll look for gaps or cracks and other damages in the opening where the old door used to be. These will need to be repaired if a new door is to be properly installed. We use a reinforcement bar to assemble panels to avoid any warping. Then, our team of door technicians secure the panels with hinges and axle supports. Next, we secure the tracks with brackets and a spring assembly. Rolleys and the torsion rod are installed for the finish. The above is a traditional standard garage door, and an automatic or custom designed garage door may entail more sophisticated services, which is why it’s always wise to hire a professional. Whether a garage door opener is defective or not working at all, our fully-insured and licensed team knows how to replace a garage door opener for a fully functioning unit. Regardless if it is a belt drive, chain drive, or screw drive, Elkhart Garage Door Services can handle installing a garage door opener of any model or brand. If the new garage door is heavier than the older model, it’s a good chance that a new garage door opener will need to be replaced to support the weight. We have experience with all types of garage door openers. From remotes, to keypad free, our experts will make sure the new garage door openers fulfills the customer’s needs. Our team of experts move expediently and answer all service calls with integrity. Whether it’s a single garage door, or a double garage door unit---we’ll get it done. From wood, steel, aluminum, custom or garage doors that have windows, Elkhart Garage Door Services has the experience to handle all garage door designs and types. Installing a new garage door can save money on electric bills, if a homeowner has a garage door attached to the home. That’s why it’s always important to consult with our team, because we know exactly what to look for, how to save the homeowner money and time, and how to properly install the garage door safely and securely. For the best in new garage door installation along with replacement and repairs, contact Elkhart Garage Door Service and get the garage door you’ve always wanted.